On May 10, 2012, Melanie and I visited the Steven F. Udvar-Hazy Center, part of the National Air and Space Museum, in Chantilly, Virginia. It is the first time I have ever been there, although I have been to the main museum in Washington, D.C., three or four times. The collection of airplanes, helicopters, rockets, spacecraft, and associated engines and paraphernalia is utterly amazing. Unfortunately, we only had two hours to take in the entire experience, so we rushed around taking pictures and reading as many of the placards as possible in that time. It is at the same time both heartening discouraging to see the names of wartime manufacturing companies that no longer exist due to consolidation or the exporting of work to other countries - even enemies like Red China. 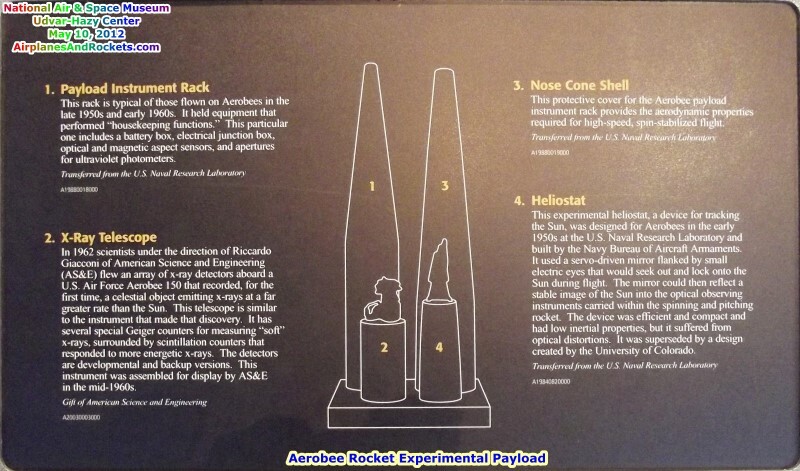 This page features rockets and missiles. Please also see Airplanes, Helicopters, Spacecraft. Here is what I have processed thus far. More will be added as time permits. One item of note is how poorly lit the museum is. I'm not sure if the intention is to give the feel of the darkness of space or, more likely, some stupid "green" requirement to keep energy consumption low. The problem is that, at least in the daytime, the windows high up on the walls, just below the ceiling, makes getting a good photo nearly impossible. You have to use a flash with just about everything, which causes shadows. Where possible, I went with a higher ASA setting (=grainier) in order to avoid shadows. Descriptions quoted from the Smithsonian website. This is an instrumentation rack with intact aspect magnetometers and some electronics that flew on an Aerobee sounding rocket. This rack includes a battery box, junction box, an optical aspect sensor, and apertures for UV photometers. This artifact is part of a collection of high-energy detectors from the Naval Research Laboratory. Overall, non-ferrous metal, possibly aluminum; steel screws around body; white plastic inserts in at least two holes around base of missile. 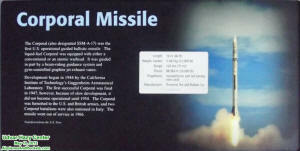 This is the Corporal, America's first operational guided missile. The liquid-propellant Corporal was equipped with a conventional or atomic warhead and ranged 75 miles. It was guided by a beam-riding guidance system and gyro-controlled graphite jet exhaust vanes. Development of the Corporal was begun in 1944 by the California Institute of Technology's GALCIT (Guggenheim Aeronautical Laboratory, California Institute of Technology). It was first successfully Corporal fired in 1947. However, its development was slow and did not became operational until 1954. The Corporal was furnished to the U.S. and British Armies and was also stationed in Italy. The Corporal went out of service in 1966. 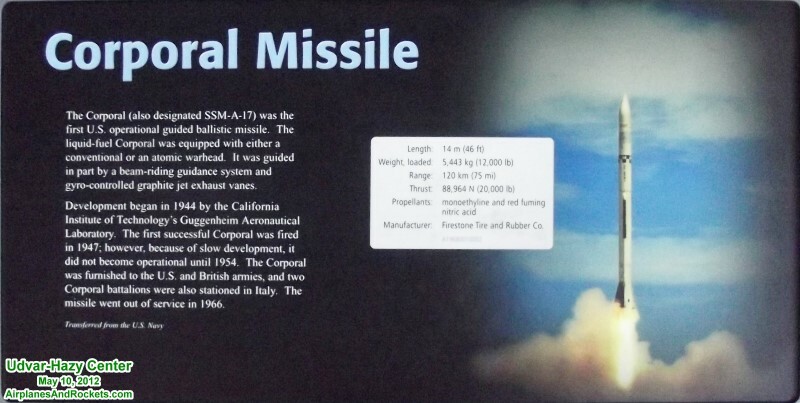 This missile was donated to the Smithsonian in 1968 by the U.S. Navy. This is probably the liquid-fuel rocket Robert H. Goddard tried to launch on September 23, 1935, at Roswell, New Mexico, in an attempt to demonstrate its capabilities to supporters Charles Lindbergh and Harry Guggenheim. The Guggenheim Foundation for the Promotion of Aeronautics funded Goddard's experiments in New Mexico. A technical problem prevented the flight. But because earlier A-series rocket launches had succeeded, Lindbergh and Guggenheim felt Goddard was on the right track. Lindbergh thus persuaded Goddard to donate a complete A-series rocket to the Smithsonian, which he did in November 1935. 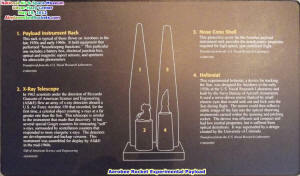 This rocket became the first liquid-fuel rocket in the Smithsonian collections. 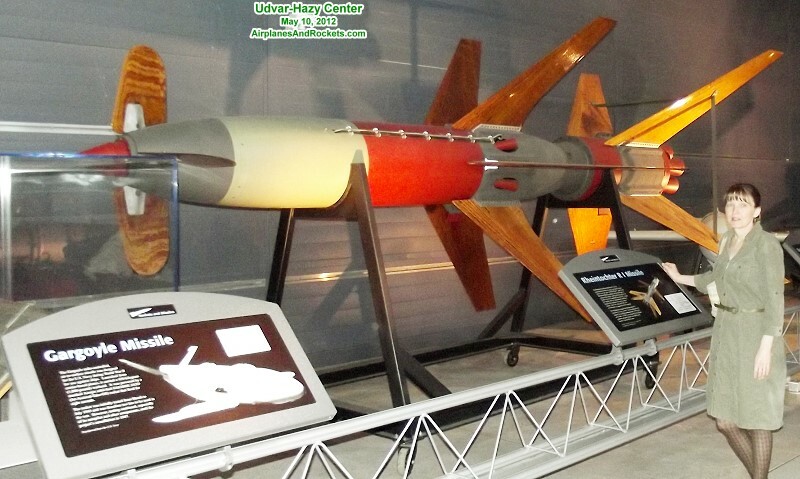 Germany developed the Hs 293 air-launched missile in World War II for use against ships or ground targets. It was basically a glide bomb assisted by a liquid-fuel rocket that fired for 10 seconds. The Hs 293 was carried under the wings or in the bomb bay of an He 111, He 177, Fw 200, or Do 217 aircraft. Its warhead was a modified SC 500 bomb containing Trialene 105 high explosive. A bombardier guided the missile by means of a joy stick and radio control. Beginning in mid-1943, Hs 293s sank several Allied ships, mostly in the Mediterranean theater. Although Germany developed many experimental versions, only the Hs 293 A-1 was produced in quantity. The Rheintochter (Rhine Maiden) R I was an experimental German two-stage antiaircraft missile tested in the last year of World War II. Built by the Rheinmetall-Borsig company for the Luftwaffe, it was one of the largest solid-fuel rockets of the war. The R I was to be supplanted by the R III, a liquid-fuel missile with two side-mounted solid-fuel boosters that enabled it reach a higher altitude. However, only six R IIIs were ever launched, as opposed to 82 R I missiles. The Smithsonian acquired this Rheintochter R I from the U.S. Navy in 1969. It was displayed in the National Air and Space Museum from 1976 to the early 1980s. In 2002 it was restored to its original condition and paint scheme for exhibit at the Stephen F. Udvar-Hazy Center. Overall, steel; propellant and pressurant spheres, steel; pulsejet tube and motor, steel; piping, aluminum; electrical wires, with transparent plastic insulation; some wires also with red and gray plastic insulation; nose cap, aluminum; warhead section, where number is painted, non-ferrous metal, possibly aluminum. The Loon, also called the JB-2 or KUW-1, was an American copy of the German pulsejet-powered V-1 or "Buzz Bomb" of World War II. 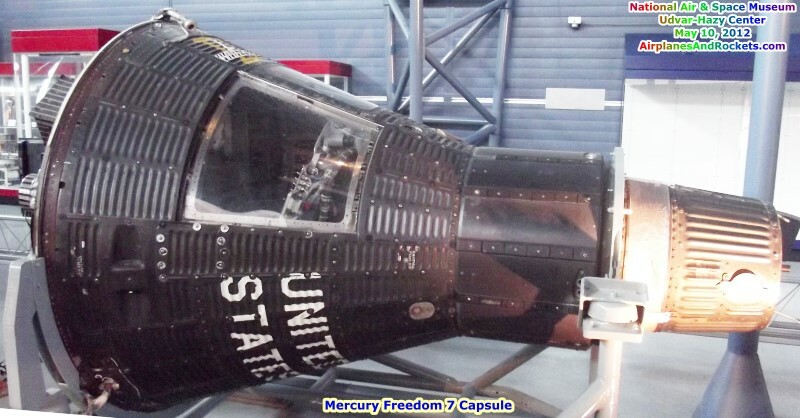 It was designed to carry a 2,200-pound high explosive warhead to a range of 150 miles and could be launched from the ground, ships, or aircraft. The air-breathing pulsejet motor is the long tube at the rear. The development of the Loon came too late for use in World War II, and it was not used in combat. However, it provided invaluable experience to U.S. Navy and Army Air Force (and later, Air Force) personnel in the handling of missiles. The Loon was cancelled in 1950. This object was donated to the Smithsonian in 1965 by the U.S. Naval Supply Center. Materials: Plastic, metals, composites, rubber. 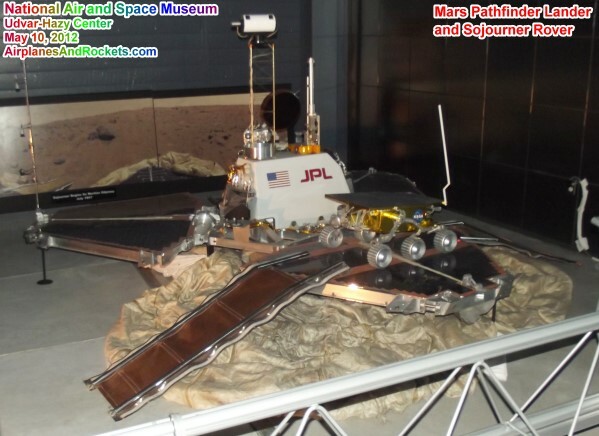 The Mars Pathfinder (MPF) spacecraft consisted of a stationary lander and a separate rover called Sojourner. 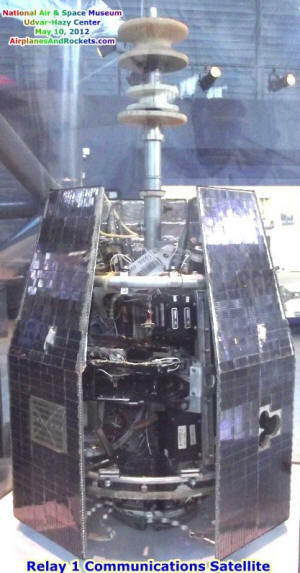 The rover rested on one of the three MPF solar panels that were folded over the spacecraft during launch and interplanetary cruise. MPF entered the Martian atmosphere directly on July 4, 1997 traveling at nearly 7,300 m/s. The entry vehicle's heat shield slowed the spacecraft to 400 m/s in about 160 seconds before deployment of the parachute and airbags. The MPF landing site was near the mouth of Ares Valles, a large outwash plain from one of the largest outflow channel complexes on Mars at 19.33° N, 33.55° W.
After landing, two ramps were unfurled from the solar panel where the rover was mounted. The rover was then deployed down one of these ramps where it proceeded to take close-up images of the surface using two color cameras on the front and a black and white camera on the rear. 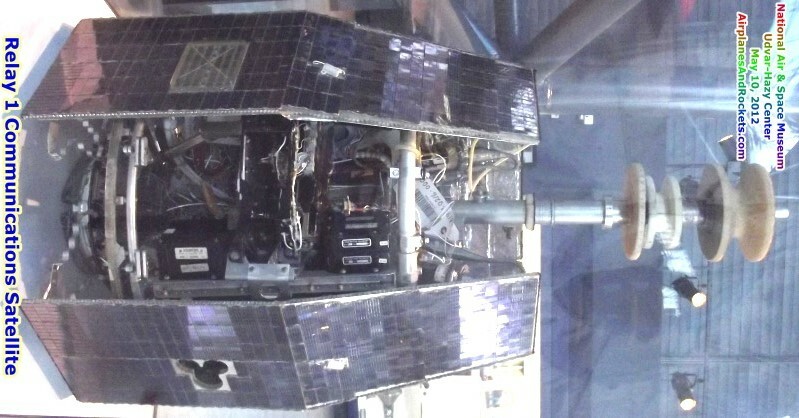 The rover also contained a rear-mounted Alpha Proto X-ray Spectrometer that provided bulk elemental composition data on surface soils and rocks. In addition, the stubby wheels of the rover provided information about the physical characteristics of the surface soil and rocks. Images were taken and experiments performed by the lander and rover until September 27, 1997, when communications were lost with the lander. However, because communications with the rover were relayed through the lander, the communications lost brought an end of the mission for the rover as well. This spacecraft is a full-scale model that was built by the Jet Propulsion Laboratory for the National Air and Space Museum. The rocker-bogie, wheels and frame are constructed of aluminum and are similar to the actual flight vehicle. However, the scientific navigation, and communication instruments are made of resin and do not possess all of the detail of the originals. This model was displayed in the "Where Next, Columbus" gallery from 1992 to 2002. Materials: Chamber and nozzle coolant passages 347 stainless steel. Propellant tanks, lines, and valves, stainless steel. Pumps, aluminum alloys; turbine, Hastealloy. Injector, OHFC copper and 347 stainless steel. Combustion chamber made of 292 stainless steel tubes. The assembly, except for inlet manifold, was furnaced brazed with gold brazing alloy. Injectors, furnaced brazed. 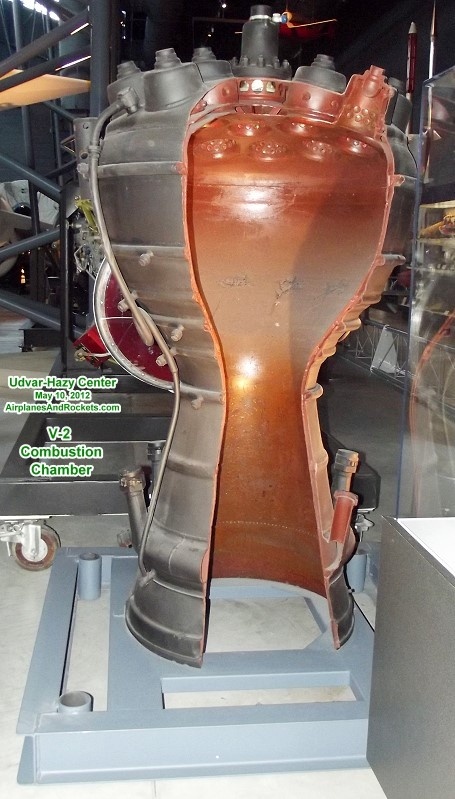 This is the H-1 liquid-fuel rocket engine, the first stage powerplant for the Saturn 1 and Saturn 1B launch vehicles, the precursors to the Saturn V that took men to the Moon in the Apollo program. The Saturn 1 and Saturn 1B were each fitted with eight H-1 engines in their first stages. The engine was developed and built by the Rocketdyne Division of North American Aviation, Inc., and used RP-1 (kerosene) and liquid oxygen. The H-1 evolved from the Jupiter missile engine. The version of the engine shown here developed about 188,000 lbs of thrust. 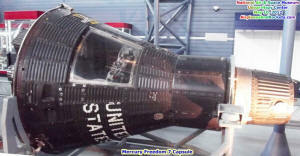 The Saturn 1B launched Apollo 7 in 1968, Skylab missions in 1973, and the Apollo-Soyuz Test Project in 1975. This engine was donated in 1968 to the Smithsonian by Rocketdyne. Project Far Side was a series of six low-cost, all-solid-fuel, four-stage, balloon-launched sounding rockets, each launched from a carrier 200 foot (62 m) diameter balloon, and built and used in 1957. 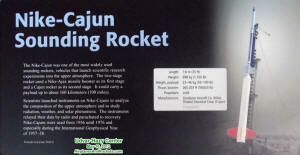 When each balloon reached its maximum altitude of about 100,000 feet (30,480 m), the rockets fired through the balloon. 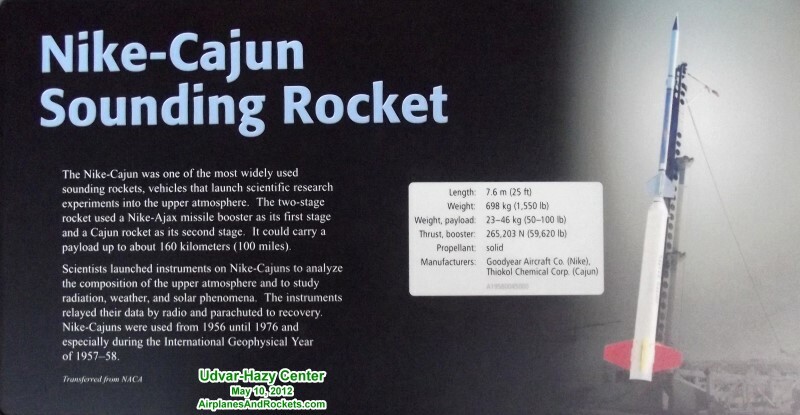 Each Far Side rocket carried a scientific payload of three to five pounds (1.4-2.3 kg) of instruments for measuring cosmic rays, electromagnetic radiations, interplanetary gases, and other phenomena. The maximum altitude reached by the Far Side rockets may have been 4,000 miles (6,440 km). This object was donated to the Smithsonian in 1965 by the Aeronutronics Division of the Ford Motor Co. Launched by NASA in 1962, Relay 1 was one of several satellites placed in orbit in the decade after Sputnik to test the possibilities of communications from space. Relay 1 received telephone and television signals from ground stations and then transmitted them to other locations on the Earth's surface. The satellite relayed signals between North America and Europe and between North and South America, and it also monitored the effects of radiation on its electronics. In conjunction with the Syncom 3 communications satellite, Relay 1 transmitted television coverage of the 1964 Olympics in Japan. This prototype of Relay 1 is covered with solar cells. The antenna on top is for receiving and transmitting communications signals; those at its base are for telemetry, tracking, and control. In orbit, Relay used spin-stabilization to orient the antennas to communicate with Earth. Overall: 6 ft. 5 in. tall x 3 ft. 9 in. wide (195.58 x 114.3cm); diameter, each injector, 21 in. ; diameter, outside, nozzle, 29 in. With a thrust of 25 metric tons (56,000 lb), the V-2 motor was the world's first large, liquid-fuel rocket engine and powered the first ballistic missile, the German V-2 of World War II. The combustion chamber was the engine's heart and burned the propellants, water alcohol and liquid oxygen, at about 2,700 ºC (4,900 ºF). Water alcohol was injected through six pipes near the bottom of the chamber, moved up between the walls in order to cool the chamber, emerging through the sides of the 18 injectors on top. Small pipes also injected alcohol into the chamber through rings of tiny holes in order to provide a insulating film of fuel along the walls. Liquid oxygen was injected directly into the top of the injector heads. A pyrotechnic igniter started combustion, after which burning was self-sustaining. NASA Marshall Space Flight Center gave this artifact to the Smithsonian in 1975. 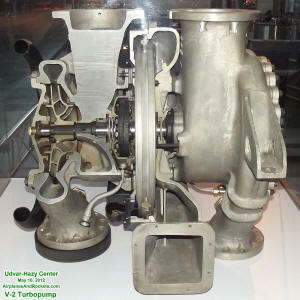 The V-2 rocket-engine turbopump drew the propellants--liquid oxygen and water alcohol--from the missile's tanks and injected them under pressure into the combustion chamber. The V-2 motor was not only the world's first large liquid-propellant rocket engine, it was also the first large rocket engine to use a turbopump, following on earlier experiments by the German Army rocket group under Wernher von Braun. This pump moved nearly 9,000 kg (20,000 lb) of alcohol and liquid oxygen from the tanks to the combustion chamber during the 60-second burning time. Driving the turbine wheels in the center of the pump were exhaust gases from a steam generator, which catalyzed hydrogen peroxide into superheated steam and oxygen. The turbine wheels in turn powered the pump impellers for the two propellants. This artifact is cutaway to show its internal mechanisms. NASA Marshall Space Flight Center transferred it to the Smithsonian in 1975.